Darkness, My Old Friend | Jess Banks schools you. I kinda wonder if the childhood insomnia had something to do with autism. I, like you, was diagnosed as an adult. 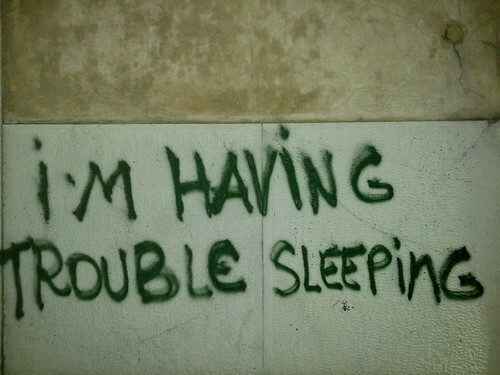 I have had trouble sleeping for as long as I can remember. I was known as a “napper” as a child. I rarely slept more than four hours at a stretch and always needed a heavy blanket on top of me to sleep that long. It got bad in the hottest months in SoCal. It was too hot for a blanket but I couldn’t sleep with just a sheet, unless it was securely tucked all the way around. Something not feasible because my sister and her dog always wiggled their way into my bed at night. My grandmother sewed washers into the edge of a sheet to weight it down. It effectively fooled my senses enough to let me sleep a little. Still, I was up and cranky every four hours. Because you had a similar experience, it makes me question more of the ins and outs of autism that haven’t been noted yet. I know this has nothing to do with the hypervigilance, though I’ve had that too since the death of my oldest.